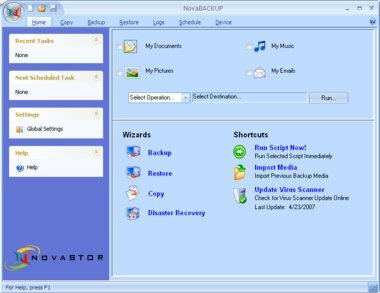 NovaBACKUP 10, NovaStor's award winning software, now incorporates local and online backup coupled with superior disk-imaging disaster recovery technology. With 2GB free online backup for 1 year, NovaBACKUP is the number one choice for simple to use, best-practice data protection. Easy setup and step-by-step wizards make this the perfect tool for you and your company, and a great data protection solution for home and small business users. NovaBACKUP, a PC World Best Buy (October 2008), is the reliable and cost-effective data protection software solution, protecting critical information 24 hours a day, 7 days a week, with safe and easy-to-manage processes and automated schedules. NovaBACKUP has a superior, multi-language (English, French, Italian, German, Spanish) user interface, and industry leading device support. Now you have the ability to backup your data to CD/DVD drives, online over the internet, or to tape drives, disk drives and other media without interfering with other programs. The Step-by-Step Wizard guides you through performing backup and restoration procedures, and the integrated disk-imaging disaster recovery means you will be up and running fast when the worst happens. The robust scheduler lets you set automatic backups down to the minute so you don't even have to think about it. Copy & Mirror functionality provides a simple method for "twinning" or "mirroring" data and directories in native format. 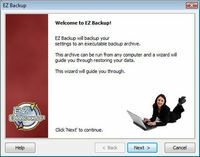 Includes integrated Open File Backup for Windows Vista/XP/2003 users too. NovaStor has been protecting millions of PCs for over 20 years. See what the New NovaBACKUP 10 is all about today with our free demo download.